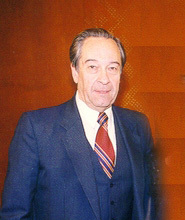 Alexander Krasotov (1936-2007). Alexander Alexandrovich Krasotov was born on May 5, 1936 in Odessa, Ukraine. In 1959, he graduated from the piano performance, composition and theory classes of the Odessa Conservatory, and in the same year, joined the faculty of his alma mater. He remained an influential and highly respected pedagogue until his death in 2007, serving for many years as professor of music theory and chairman of the composition department at the Odessa Conservatory. In his own compositions, Mr. Krasotov employed a diverse "polystylistic" approach, often infusing elements of jazz and pop music into traditional structures and forms. His catalogue includes symphonic and chamber music alongside theatre music, musical comedies and songs.